It was a good week if you had the correct players from Townsville or a really bad week for nearly everyone else as a swathe of stars under-performed. Hopefully we don’t have a repeat performance this week as Adelaide and Wollongong play double matches. Josh Pace stepped back into form with style and led all scorers this round with 90. He was ably supported by Todd Blanchfield (82) and Steven Markovic (74), while Brian Conklin was acceptable with 50. Only two players with single games broke the half century, with Gary Wilkinson smashing out 70 on the back of some impressive shooting, while Mitch Creek continues to show improvement and got 58. Whilst players like James Ennis (22), AJ Ogilvy (22), Damian Martin (14) and Anthony Petrie (8) were scoring well below expectations, the major disappointments were Gary Ervin (0) and Peter Crawford (-2). It’s hard to know which was worse. Ervin has been traded into teams en-mass over the last two rounds and was particularly upsetting for coaches like myself who only traded him in this week. However Crawford probably gets the dishonorable mention after having two chances and returning a 0 and a -2. 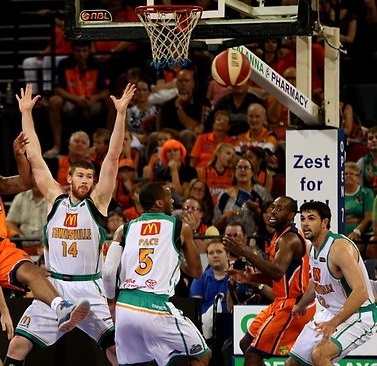 This week Adelaide and Wollongong have double matches and both offer some good prospects as they both also have double matches during the Dream Team finals, the round 22 semi-final for Adelaide and the round 23 grand final for Wollongong. I will look at which players you can get now based on how likely they are to be keepers. Definitely: Daniel Johnson has been tearing it up of late and is almost a “must have” player. The only hindrance is that his price reflects his recent form and he’s unaffordable for many people. Probably: After a slow start to the season Adam Gibson has been really solid almost every game. He’s a touch on the more expensive side but will deliver. Anthony Petrie has been giving his usual solid scores for most of the season but is in a mini slump right now. His price has dropped as a result and so he seems cheap, but with Adelaide’s depth there is always the chance that he might stay in a secondary role. Gary Ervin looked like he’d recovered from his injury and was ready to skyrocket back up in price. Then he scored 0. Ervin has the occasional game which is a disaster but these don’t happen often and his upper limit makes up for it. Possibly: Mitch Creek has been showing some great form this season but hasn’t yet developed the consistency to make him a lock. He offers a potential point of difference though that could be very rewarding if he delivers. Unlikely: Jason Cadee thrived while Ervin was resting through his injury but less court time has seen his scores and price plummet. He has the potential but I don’t think he’ll get enough opportunity for anything other than occasional good scores. Luke Schenscher has also been taking a back seat whilst Johnson has dominated. He’ll offer good scores sometimes but will hardly play at all other times. Jarrid Frye seems to have gotten worse as the season has progressed and with three scores of 2 in his last four games he’s probably not worth the gamble even with his absurdly low price tag. Jarrid Frye has been sacked, better trade him out if you’ve got him. Definitely: Unfortunately for Wollongong none of their players are absolute locks. Probably: Rotnei Clarke comes close though but has intermittent poor games where he doesn’t fire. He’s a really good price at the moment and is the best option to get from Wollongong. Kevin Tiggs turned his season around in round ten and since then has only had one poor score. He’s slightly more expensive but has good keeper potential. Although down on output compared to last year Oscar Forman has been very consistent this season and is a safe option priced at what you’d expect, with the looming chance of a huge game. Possibly: David Gruber has had a good run over the last few rounds and has been showing some very nice touch for a player who has made his career on being reliable. It’s for this reason though that I’d be hesitant about getting him, there’s every chance he could go back to old form as opposition adjust. Unlikely: Larry Davidson has been erratic since his return from injury, although he does have the potential and has just had a very good match. Rhys Martin is an exceptional leader for Wollongong but this very attribute has been hindering his dream team scoring this season as he organises and leads the team often without getting statistics himself. Tim Coenraad shows glimpses but it never seems to carry through. He has just had back to back good matches though so if there’s a time for it to happen this is probably the most likely. Sydney also has the added bonus of having double matches during both rounds of the finals, sharing them with Adelaide and Wollongong as discussed earlier. New Zealand and Townsville players are great if you can afford to trade them back out again for finals..
Much the same as was discussed last week, you need to look at trading out your Cairns and Perth players to get keepers. After both teams lost to Townsville over the weekend and posted lots of poor scores, the only players who you wouldn’t trade out are Ennis and potentially Loughton. However, I got asked if it would be worth trading Ennis to Daniel Johnson and upon consideration this actually could be an acceptable trade. Johnson has been scoring very high lately so with his two extra games he will probably score more points in the remaining rounds. Obviously it’s better if you can have both, but if the only way for you to get Johnson is to lose Ennis then it might be worth the gamble. Daniel Johnson is the standout choice here. His current form is outstanding and should continue, despite a road double against Perth and Melbourne. Rotnei Clarke then Adam Gibson would be my next choices if you can’t afford Johnson, with fall back options of Gary Ervin, Kevin Tiggs then Anthony Petrie if needed. As the season starts to come to a close, sometimes a gamble trade is needed if you want to push up a few extra ranks. Have a look at the “Total # of Selections” and if the number is 300 or less and they’re a good scorer then they’re perfect to gamble on (eg Adam Gibson). There are three games on Friday night, which is also Valentine’s Day. I’ve cleared Saturday morning and plan to get up and watch replays on NBLTV, hopefully without knowing the scores. The plan is that this should stop me looking at my phone for scores and thus stop me from getting in trouble. Cheers for the work all season mate, your articles have really helped. Wonder what happens to Ervin’s scores now that R Carter has been signed by 36ers? Carter’s inclusion will likely change the Adelaide rotations a lot and I’m guessing that there will be more shooting opportunities for Gibson and more court time for Petrie and Schenscher. Will be fascinating to see (and interesting to see what price Carter is, could be a great gamble selection). I better go and edit the section about Jarrid Frye too, although hopefully they mark him gone in the game. Bummer if you had him. Rotnei is probably a better choice and having the three guards isn’t too much of a problem, if one of them is dpp swing them to the Fwds, and just plan to trade one out after this round. And although DJ is worth getting, I wouldn’t trade out Young for him. You’ll want Young back later. Although if you’ve still got heaps of trades (10+) then you’re probably fine to do it. Yes that is my Plan I have 10 trades before this week! With Blanchfield’s big score Last week he will be on the rise Think I may then Downgrade Martin or Tiggs! Tiggs or Ervin for Captain? Above I put Ervin ahead of Tiggs, but given Adelaides addition of Carter, Tiggs is probably the safer option. Who to bring in first? Don’t want to trade Ennis but need DJ so freeing Conklin in and straight back out to the Sixers gun. Sorry Brian. Sacrifices have to be made. I’d probably say Abercrombie as he looks like he’ll go up in value more this week, but it’s really a personal preference call. However, if you’re short on trades then get Young as you’re guaranteed to want him all season and he has more games.